The Shirt of Nessus, or Tunic of Nessus, is in essence an article of clothing that appeared in the stories of Greek mythology. It was more though than just a shirt, for ultimately it was the means by which the Greek hero Heracles was killed. ​The Shirt of Nessus originally belonged to the centaur Nessus. Nessus had survived the Centauromachy, the battle fought at the wedding of Pirithous and Hippodamia, and potentially was also present when Heracles killed many centaurs upon Mount Pholoe. Subsequently, Nessus had made his way to the banks of the Aetolian River Evenus, whereupon the centaur became the ferryman who transported people across the river upon his back. The ferryman Nessus was encountered by Heracles and Deianira, and Deianira was placed upon the back of the centaur, so that she might have an untroubled crossing of the River Evenus. The beauty of Deianira was such that Nessus decided that he wanted to abduct the wife of Heracles, and when upon the far bank of the River Evenus, Nessus began to run away with Deianira. Deianira screamed out alerting Heracles to events upon the far bank, and although the river was wide, Nessus was still in range of the arrows of Heracles, and within seconds an arrow was embedded in the body of the centaur. 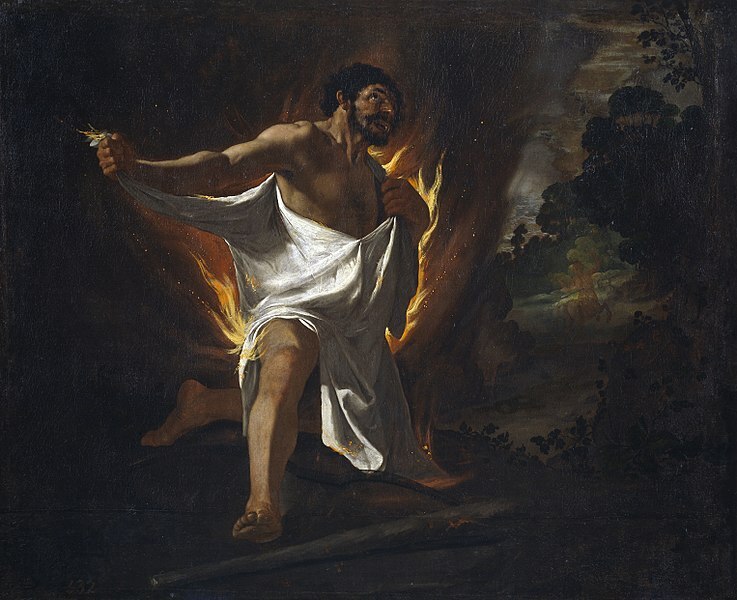 Even as Nessus lay dying, he was plotting his revenge upon Heracles, and Nessus spoke out to Deianira convincing her that his blood soaked shirt would act as a powerful love token, if Deianira ever felt that the love of Heracles was waning. Of course the blood soaked shirt of Nessus was not a love potion, but was a poisoned robe, for the blood upon the shirt was mixed with the poisonous blood of the Lernaean Hydra, for Heracles’ arrows were covered in the blood of the monster that he had killed many years before. The tricked Deianira would believe the dying centaur, and taking the Shirt of Nessus, hid it away from her husband. ​Several years passed, and to Deianira it did seem that Heracles love for her had diminished, and she feared that Iole would replace her in the hero’s affections. Thus, when Heracle was returning from Oechalia with Iole, Deianira had Lichas deliver the cloak to her husband. Years might have gone by since the skilling of Nessus, but the poisonous blood which had seeped into the fabric of the Shirt of Nessus, had not diminished in toxicity. Thus, when Heracles put on the Shirt of Nessus, the poison of the Hydra transferred onto his skin, killing him slowly. As the pain overtook him, Heracles constructed his own funeral pure, and lay upon it in pain, until Poeas came along to light it.